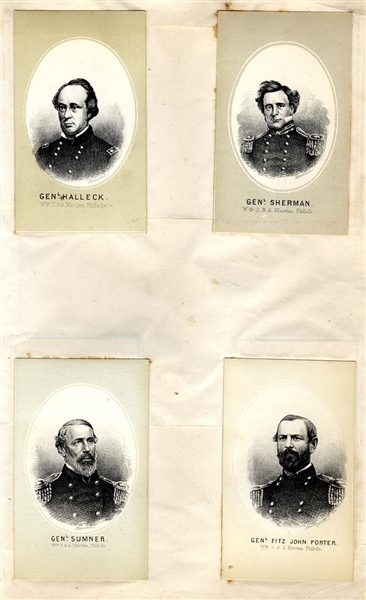 A collection of +/- 50 Civil War Commanders trade cards, each affixed to album pages which are separate pages. The cards are CDV sized and produced by Patch & Hight, Books and Stationary, Bangor Maine as printed on the back. The cards are both Federal and Confederate commanders. the expected leaders are present and some no so expected such as Col. Kit Carson, Col. Berdan, Gideon Wells, Lieut. Worden, and more.